Key illustrators and designers behind the creation of Pokémon in Ken Sugimori, Atsuko Nishida, and Koji Nishino recently got together to talk all-things Pikachu in a big interview with Yomiuri. From left to right: Koji Nishino, Atsuko Nishida, and Ken Sugimori. Yomiuri: Tell us how Nishida-san ended up being in charge of Pikachu’s designs. Since the game was about getting monsters to fight, “collect and trade,” having only tough-looking monsters wasn’t enough. After various considerations, it was decided that we needed cute monsters. What kind of request did you get at the time? Atsuko Nishida, series Pokémon and character designer: At the time, I was in charge of character designs for a Mega Drive game. (After joining Pokémon) I was requested only requested to make “an electric-type” and “a monster with two evolutions.” There wasn’t any specifications about animals (to base it on). I didn’t draw it on paper and directly designed the pixel-art, so there isn’t any data of it now, but the first prototype I designed for Pikachu was a daifuku-like creature in the shape of a long daifuku with ears sticking out. I’ll leave the rest to your imagination… but it was nothing like the Pikachu you know today. Nishida: I named it without giving it much thought, but since it was an electric type, I threw in a “Pika” [Editor’s note: from Japanese onomatopoeia “Pika-Pika” meaning to glitter, sparkle, or shine]. I didn’t have a mouse in mind for the “-chu” [a Japanese mouse noise like “squeak”]part, and I actually don’t remember the reason… but anyway, the name “Pikachu” came first, and from there it was made into a mouse. Were there twists and turns before it became the Pikachu that eventually appeared in the game? Sugimori: So you have this big guy (Nishino, pictured above), who was actually the model for Snorlax, and he’s abnormally noisy about cute things. Nishida: [to Nishino] You were like “cuter!” and I remember thinking “ahh, this is frustrating!” I was so absorbed in its revisions, I just wanted to somehow get your approval. Did you keep sending it back, Nishino-san? Nishino: No, it didn’t take long for it to take shape (of the very first completed form). Nishida: Since it was an electric-type, I thought it would be nice to have it store electricity in its cheek pouches. At the time I was really into squirrels, and since squirrels store food in their cheeks I thought about giving it cheek pouches. Also, squirrel tails are cute so I gave it a tail as well. However, I did want to give it some kind of “lightning” part to it, so I gave it the lightning-shaped tail. Did you have any squirrels as pets, Nishida-san? Nishida: I didn’t, but I was really into the idea of wanting one as a pet. It wasn’t necessarily a popular thing with people at the time. I love animals, and at the time I had a pet ferret and turtle at my home, and since squirrels have a cute and comical way of moving, I wanted one as a pet. The part about storing electricity in the cheek pouch was the only part I used a squirrel as a reference. For example, when a hamster stores food their entire bodies become round, right? However, for squirrels it is just their cheeks. In the game, Pikachu is kind of a “rare character” who doesn’t appear much. Nishino: This is embarrassing, but since I like Pikachu so much, I get this feeling of “not wanting to let other people have Pikachu.” At first, I even considered simply “hiding” Pikachu. Sugimoto: Compared to other Pokémon, its appearance rate was extremely low. So Nishino’s mysterious possessive nature worked out. So during its time as a daifuku, it didn’t have cheek pouches, correct? Nishida: It did not! The cheek pouches didn’t exist during the daifuku time! During the process of making it cuter, I added the cheek pouches because I wanted to give it a sense of “charging.” That said, I only thought of a squirrel for the cheek pouches part, and the rest came from putting together all these parts that I thought were cute. What about the dark ear tips? Nishida: I believe that was a leftover from its time as a daifuku. Can you tell us how its body ended up being yellow? Sugimori: Game Boys only had black and white as colors. When Pokémon Red & Green was first in development, none of the Pokémon had any colors. They were represented in black and white and were colored that way in pixel-art style. Back when it was in development (in 1994) they released an adapter called the “Super Game Boy” that let you play Game Boy software on television through the Super Famicom. The Super Game Boy had a function that added pseudo-colors to a game, and that the first time we were able to give Pokémon colors. I was the one to decide on Pikachu’s color, and since they say yellow is the color attribute of electricity, I thought it would be nice to give it a color that made its type easier to understand, and I decided to go with yellow. The stripes on Pikachu’s back also seem special. Nishida: I didn’t put much thought into that one, but when Pokémon go into battle you see their backs right? At the time I felt that its back was lonely without anything on it. Nishida: Yes. It was “Pika(chu),” “Rai(chu),” and “Goro(chu).” The Pokémon known as Gorochu bared fangs and even had a pair of horns. Sugimori: There wasn’t any problem with its appearances, but it was omitted due to matters surrounding game balance. In the first game there was 151 Pokémon, but what was Pikachu’s initial reception within the company? Sugimori: When the number of Pokémon started coming together, we needed to shake things up. That’s when I printed out the pixel-art and had a popularity contest in the company asking “which one do you like?” And Pikachu was by far the most popular. Pikachu’s popularity really started heating up when the 1997 anime started and the protagonist Satoshi (Ash) chose Pikachu as his partner. Sugimori: That was definitely the biggest break. That was actually a decision from director (of the anime series) Kunihiko Yuyama. In the game you choose one of Squirtle, Charmander, and Bulbasaur, but if Satoshi chose one of those three as his partner (in the anime) it would’ve created a gap with the kids who didn’t pick that Pokémon, so I believe that’s why he went with Pikachu. What about Pikachu’s difference in cry in the game and anime? Sugimori: Yes, after it became an anime we also took some influence from it. Both the game and anime shared influences, and Pikachu further evolved. At first its body type was more plump, but its neck was made more defined and its back was made longer. From there the design on the game production side also changed. And that’s how we got the Pikachu you know today. By the way, I never expected to hear it cry “Pikachu!” in the anime. And the anime’s voice actress Ikue Otani worked out well. Nishino: It was a big shock. I thought she was great and completely had our approval. Today, everyone around the world loves Pikachu, but why do you think that is? Nishida: I think there’s a strong sense that comes from being raised by the fans. And I believe that’s what made Pikachu what it is today. I like to see Pikachu as the fruit of everybody’s love. Sugimori: I think it’s because Pikachu is “easy to understand.” At first we couldn’t use colors well and the resolution was coarse. 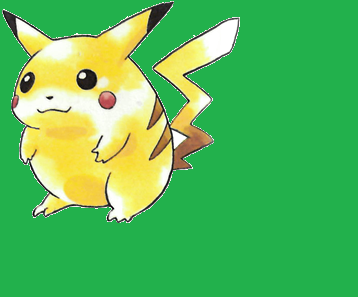 From there, Pikachu was made to have a characteristic shape and its colors were simple. It was easy to understand yet still had characteristics. I believe that was the secret behind Pikachu’s universal love. The worldwide popularity of Pokémon GO seems to have connected for another big break. Nishida: It gave people who didn’t get to play Pokémon on a gaming device an opportunity to get to know Pokémon. It really makes me happy to see them get reacquainted again. Sugimori: Originally we were making it into a simple game that can be played by a broad age group of players, but it’s true that it is difficult to reach people who don’t play video games or own any gaming devices. I thought that it was amazing that thanks to Pokémon GO we were even able to reach people in middle school and high school. It was surprising, even to us. I believe it was able to reach so many people thanks to the simple characters and how easy it is to grasp. While Pikachu may be just a single Pokémon of the games, Pikachu is also the symbol of Pokémon around the world. There’s just something nice about talking to people about Pikachu and how easily they understand. Do you ever think about creating the next “Pikachu”? Nishida: As an artist, it is always my intent to create characters that can be cherished. However, for now Pikachu is a one-and-only. It was a big surprise that my hard work that went into getting Nishino-san’s approval led to a worldwide popularity as a result. Nishino: I would like to see other Pokémon get some attention. Like Clefairy. Sugimori: Clefairy was the result of my attempt at creating a “cute Pokémon.” However, Pikachu managed to impressively take away the popularity and left Clefairy in the shade.